5 samples of your choice from our assortment of Japanese teas, as a low-price option to try our Japanese Bancha, Sencha, Kabusecha, Gyokuro, Shincha und Genmaicha teas. 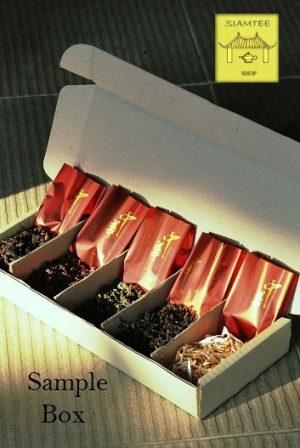 The Siam Teas Sample Box ‘Your Selection’ at Siam Tea Shop! 5 teas of your choice from our assortment of teas from Japan, ca. 15 grams / tea sample. Choose your favorites to try from our Japanese Bancha, Sencha, Kabusecha, Gyokuro, Shincha, and Genmaicha teas. For more information please see the product description below.